Excel provides you several options for formatting dates. In addition to the several built-in date formats that exist, you can create custom date formats. 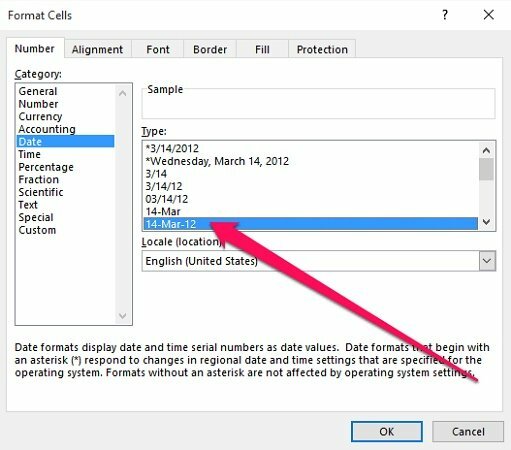 You frequently format cells or cell ranges in a particular way, and the formatting rules you apply include date formats. Regardless of your situation, if you're interested in understanding how you can use Visual Basic for Applications for purposes of formatting dates, you've found the right place. This particular Excel tutorial focuses on the last item of the list above (the Range.NumberFormat property). I may cover the Format function and Range.NumberFormatLocal property in future blog posts. If you want to be informed whenever I publish new content in Power Spreadsheets, please make sure to register for our Newsletter by entering your email address below. In addition to explaining the Range.NumberFormat property, I explain the different date format codes you can use and present 25 date formatting examples using VBA. You can use the following detailed table of contents to navigate to the section of this tutorial that interests you the most. For purpose of this Excel tutorial, I use an Excel workbook that contains the full match schedule of the 2014 Brazil World Cup. This Excel VBA Date Format Tutorial is accompanied by an Excel workbook containing the data and some versions of the macros I explain below. You can get immediate free access to this example workbook by subscribing to the Power Spreadsheets Newsletter. These are the dates that I format throughout this tutorial. However, since the focus of this macro is in formatting dates using VBA, we need a Sub procedure. The following image shows the basic structure of the macro (called “Format_Dates”) that I use to format these dates. As mentioned at the beginning of this Excel tutorial, you can generally use the Range.NumberFormat property to format dates. The Range.NumberFormat property sets a Variant value. This value represents the number format code of the relevant Range object. For these purposes, the Range object is generally a single cell or a range of cells. Strictly speaking, in addition to setting the NumberFormat property value, you can also return the property's current setting. As explained by Excel authority John Walkenbach in Excel VBA Programming for Dummies, the NumberFormat property is a read-write property. However, if you're reading this Excel tutorial, you likely want to modify the property, not read it. Therefore, this guide focuses on how to change the NumberFormat property, not how to read it. You can, however, easily examine the number format of a cell or range of cells. I explain how you can read a property value in this tutorial. In such cases, if (i) you select a range of cells and (ii) all the cells don't share the same format, the Range.NumberFormat property returns Null. NumberFormat is just one of the many (almost 100 by my count) properties of the Range object. As explained in Excel Macros for Dummies, once you've selected a range of cells (as the sample Format_Dates macro does), “you can use any of the Range properties to manipulate the cells”. This Excel tutorial is quite specific. The only property of the Range object that I cover in this blog post is NumberFormat. In fact, I only explain (in high detail) one of the applications of the NumberFormat property: to format dates with VBA. In this case, “expression” stands for the Range object, or a variable that represents this object. You can, as explained at globaliconnect.com, use another expression instead of Selection. What matters, as I mention above, is that the expression stands for a Range object. #1: Determine whether the property you're working with uses arguments and, if that's the case, determine what is the argument you want to use. These arguments are the ones that specify the value that the property takes. #2: Use an equal sign to separate the property name from the property value. As shown in the examples throughout this tutorial, if you're implementing the NumberFormat property using the framework structure of the sample Format_Dates macro, argument values are generally surrounded by double quotes (” “). Item #1: A reference to the NumberFormat property. Item #2: The equal sign (=). Item #3: The new value of the NumberFormat property, surrounded by double quotes (” “). The format code is the same string as the Format Codes option in the Format Cells dialog box. This is quite a mouthful, so let's break down the statement and process into different parts to understand how you can know which format code you want to apply. More precisely, you can find the string that represents a particular format code in the Format Cells dialog box in the following 5 easy steps. This process is, mostly, useful if you don't know the format code you want to apply. Generally, as you become more familiar with number format codes, you'll be able to create macros that format dates without having to go through this every time. For these purposes, refer to the introduction to date format codes below. Method #1: Click on the dialog box launcher at the bottom-right corner of the Number command group of the Home Ribbon tab. Method #2: Go to the Home tab of the Ribbon, expand the Number Format drop-down list and select More Number Formats. Method #3: Use the “Ctrl + 1” keyboard shortcut. Regardless of which of the methods above you use, Excel displays the Format Cells dialog box. If you use method #1 or #2 above, Excel displays the Number tab, as in the image above. This is the one you need in order to find the date format codes. However, if you use method #3 (keyboard shortcut), Excel may show you a tab other than the Number tab (as shown above). In such a case, simply go to the Number tab. Since you're interested in date format codes, choose “Date” in the Category list box on the left side of the Format Cells dialog box. Once you've selected the Date category, Excel displays the built-in date format types inside the Type box on the right side of the Format Cells dialog box. This allows you to select from several different date format types. Once you've selected the date format type you're interested in, click on “Custom” within the Category list box on the right side of the Format Cells dialog. Once you've completed the 4 steps above, Excel displays the date format code that corresponds to the date format type you selected in step #3 above. This format code is shown in the Type box that appears on the upper-right section of the Format Cells dialog box. The date format code shown in the example above, is “[$-en-US]d-mmm-yy;@”. This format code corresponds to the option “14-Mar-12” with the English (United States) locale that I selected in step #3. Once you have this date format code, you can go back to you VBA code and use this as the argument for the Range.NumberFormat property. As I show below, you can achieve the same date formatting effect without the first part of the date format code which makes reference to the locale settings. That means you can delete “[$-en-US]”. However, for the moment, I leave it in. Before executing the Format_Dates macro, I select the cell that I want to format. In this case, I choose the date in the first row of the table. This corresponds to June 12 of 2014, which is the date of the match between Brazil and Croatia. The 5-step method to find date format codes described above can be useful in some situations. However, Excel date format codes follow some general rules. If you know them, you don't have to go through the whole process described above every single time you want to create a macro that formats dates. The date format codes that you can use to format a date using VBA appear in the table below. As shown in the following sections, you can use these codes to create different types of date formats to use in your VBA code. Month m Month is displayed as number. Month mm Displays month as a number. Day (Number) dd The day number is displayed. Note, however, that the Format function (which I mention at the beginning of this Excel tutorial) supports slightly different date format codes from those appear in this table. The VBA code of the sample Format_Dates macro. The resulting format in one of the dates within the sample table that contains the 2014 Brazil World Cup schedule. You can have Excel display just one of the items of a date, regardless of whether it's the month, the day or the year. To do this, the argument of the Range.NumberFormat property must only include the format code of the relevant item. The month is displayed as a number without a leading 0. Let's go back to the sample table with the schedule of the 2014 World Cup. I select the second date, which is June 13 of 2014 and corresponds to the match between Mexico and Cameroon. The following image shows the results after the date is formatted by the Format_Dates macro. Notice how only the month number (6, corresponding to June) appears. Notice, also, that the value in the Formula Bar continues to be the same. The only thing that changes is the format of the date displayed in the cell itself. The month is displayed as a number. However, in this particular case, the month is displayed with a leading 0. In other words, if the relevant month is between January (month 01) and September (month 09), a leading 0 is added. This particular macro is applied to the third date in the 2014 World Cup schedule. The date is June 13 of 2014. The teams playing are Spain and Netherlands. Let's continue with the same process of applying the new date formats to the match dates of the 2014 Brazil World Cup. In this case, the relevant date is June 13 of 2014. The match played is between Chile and Australia. The following image shows how the cell looks like after the new format is applied. As in the previous cases, the value of the date itself (as shown in the Formula Bar), doesn't change. In order to apply this format to a date in the sample 2014 Brazil World Cup schedule, I select the corresponding cell. In this case, the date is June 14 of 2014 and corresponds to the match between Colombia and Greece. This macro is applied to the date June 14 of 2014. This date corresponds to the match between Uruguay and Costa Rica. Just as you can use VBA to format a date in a way that only the month is displayed, you can do the same for the day. In other words, you can use Visual Basic for Applications to format a date and have Excel display only the day. The following 2 sections show how you can modify the sample Format_Dates macro so that only the day (number) is displayed when the date is formatted. The date to which this macro is applied in the sample workbook is June 14 of 2014. In this case, the relevant match is that between England and Italy. If I continue going down the 2014 Brazil World Cup match schedule (as until now), this version of the Format_Dates macro would be applied to the date June 14 of 2014. This date corresponds to the match between Ivory Coast and Japan. However, since this the day (14) doesn't require a leading 0, the result of applying the new version of the Format_Dates macro would be the same as that obtained above for the date of the match between England and Italy. To see how this date format works like whenever the corresponding day is only one digit long, I go further down the sample table to one of the matches played at the beginning of July of 2014. More precisely, I apply the current version of the Format_Dates macro to the date July 1 of 2014. The match to which this date corresponds to is that played between Argentina and Switzerland. The following image shows the results of applying the Format_Dates macro to this date. Notice how, now, Excel adds a leading 0 to the day number in the cell. The previous section shows how you can use VBA to format a date in such a way that only the day number is displayed. You can also format a date in such a way that only the weekday is displayed. The following 2 sections show 2 ways in which you can implement this date format by using VBA. Let's go back to the match between Ivory Coast and Japan to which I make reference above and apply this new date format. The date of this match is June 14 of 2014. Let's execute this macro for purposes of formatting the date of the match between Switzerland and Ecuador in the 2014 Brazil World Cup match schedule. This date, as shown in the image below, is June 15 of 2014. So far, you have seen how you can format a date using VBA for purposes of displaying only the (i) month, (ii) day number or (iii) weekday. In this section, I show you how to format a date using VBA to display only the year. This date format is to applied to the date June 15 of 2014. This corresponds to the World Cup match between France and Honduras. I apply this date format to the date of the match between Argentina and Bosnia and Herzegovina. This is June 15 of 2014. The examples in the section above explain different ways in which you can format a date using VBA to display a single item (month, day or year) of that particular date. Having the ability to format a date in such a way that only a single item is displayed is helpful in certain scenarios. Additionally, once you know the format codes that apply to each of the individual items of a date, you can easily start combining them for purposes of creating more complex and advanced date formats. In any case, in a lot of cases, you'll need to format dates in such a way that more than 1 element is displayed. In the following sections, I go through some date formats that result in Excel displaying more than 1 item of the relevant date. Even though I don't cover every single date format that you can possibly implement, these examples give you an idea of the possibilities you have at your disposal and how you can implement them in your VBA code. The version of the Format_Dates macro that is applied. The result of executing that macro for purposes of formatting 1 of the dates of a match in the sample workbook that accompanies this blog post. The following version of the Format_Dates macro formats a date in the form m/d/yyyy. The following image shows the result of applying this format to the date June 16 of 2014. This date corresponds to the match between Germany and Portugal. Russia vs. Korea (June 17 of 2014) uses the date format code d-mmm-yy. Australia vs. Netherlands (June 18 of 2014) has the date format code dd-mmm-yy. Notice that the only difference between both format codes is in the way the day is represented. In the first case, the format code uses “d”, which displays the day number without a leading 0. In the second case, the format code is “dd”, which adds a leading 0 whenever the day number has a single digit (between 1 and 9). Both format codes (d-mmm-yy and dd-mmm-yy) result in the same date format when the number of digits of the day is 2 (between 10 and 31). The image below shows this. In this particular case, the Format_Dates macro is applied to the date July 1 of 2014, when Belgium played against the USA. Notice, especially, the leading 0 in the day number (01 instead of 1). The resulting date format when this version of the Format_Date macro is executed is as shown in the image below. The formatted date is June 18 of 2014, corresponding to the match between Spain and Chile. The results of executing the macro on the date June 18 of 2014 are shown in the image below. In this case, the date corresponds to the World Cup match between Cameroon and Croatia. The following version of the sample Format_Dates macro formats dates so that they're displayed using the form mmmm d, yyyy. The next image shows the results of executing this macro while a cell with the date June 19 of 2014 is active. This date corresponds to the world cup match between Colombia and Ivory Coast. The following version of the sample Format_Dates macro makes Excel display dates using the format mmmmm-yy. Further above, I show versions of the Format_Dates macro that use the format codes d-mmm-yy and dd-mmm-yy. The version of this macro displayed in the image below results in a similar date format. The main difference between this version and those displayed above is that the version below displays the 4 digits of the year. The following version of the sample Format_Dates macro makes Excel display dates using the default long date format under the English (United States) locale settings. So far, this Excel tutorial includes 24 different examples of how you can use Visual Basic for Applications to format dates. The date formats introduced in the previous sections are relatively straightforward. These basic date formats include several of the most commonly used date formats in American English. You can also use them as a basis to create other date formatting macros for less common date formats. These basic date formats are, however, not the only ones you can apply. More precisely, once you have a good knowledge of how to apply date formats using VBA, you can start creating more complex constructions. You can add a carriage return in custom date formats. This allows you to display different items of a date in different lines within a single cell. The following screenshot shows an example of a date format with carriage returns. The formatted date is June 20 of 2014, corresponding to the World Cup match between Switzerland and France. This example works with a date format that only includes month (using the format code mmmm) and year (using the format code yyyy). You can tweak the macro that I introduce below in order to adjust it to your needs and use any other date items or formats. You can use Visual Basic for Applications for these purposes. The following macro (called “Format_Dates_Carriage_Return”) is the one that I've used to achieve the date format shown in the image above. Begins with a statement of the form “With object”. In the case of the Format_Dates_Carriage_Return macro, this opening statement is “With Selection”. As explained above, the Application.Selection property returns the object that is currently selected. When formatting dates using the sample macro above (Format_Dates_Carriage_Return), the selected object is a range of cells. Has 1 or more statements in its body. You can easily identify these 2 statements within the Format_Dates_Carriage_Return macro due to the fact that they're indented. Closes with an End With statement. The object to which all of the statements refer to is that returned by the Selection property. Statement #1: .NumberFormat = “mmmm” & Chr(10) & “yyyy”. Statement #2: .RowHeight = .RowHeight * 2. Statement #3: .WrapText = True. I explain each of these statements below. Using the With statement allows you to, among other, simplify the syntax of the macro. I use this statement in other sample macros throughout Power Spreadsheets, including macros that delete blank rows. Most of this statement follows exactly the same structure of (pretty much) all of the other macro examples I include in the previous sections. There are, however, a couple of new elements. Within the Visual Basic for Applications environment, the ampersand (&) operator works in a very similar way to how it works in Excel itself. The Chr Function returns a string. The string that is returned is determined by the particular character code that you feed as an argument. “Chr(10)” is what actually adds the carriage return between the date's month and year. The Range.RowHeight property allows you to set the height for a row. The expression to the right side of the equal sign (=) takes the current row height and, using the asterisk (*) operator, multiplies it by 2. The result of applying this property change to the sample chart with the 2014 Brazil World Cup Match Schedule is that a row can now fit the 2 date elements that are separated by the carriage return. Compare the following 2 screenshots to see the difference this statement makes in the date format. The first image shows what happens when the Format_Dates_Carriage_Return macro is executed without having the statement under analysis. The formatted date, which corresponds to the match between Honduras and Ecuador, is June 20 of 2014. The image below shows the result of including the Range.RowHeight property for purposes of doubling the row height. The formatted date corresponds to that of the match between Argentina and Iran (June 21 of 2014). Notice that this format isn't yet what we want. More precisely, the month and year that correspond to the formatted date are displayed on the same line. Element #5, which I explain below, fixes this. If the height of the cells whose date format you're modifying is enough to fit all of the elements/lines, you may not need to include this particular statement in your date-formatting macro. In other cases, you may need to change the factor by which you multiply the current row height. In other words, instead of using the number 2 at the end of the statement (as I do in the sample macro), you may need to use a different number. The use of the Range.RowHeight property is optional and doesn't affect the date format of the selected cells. You may choose to omit it from your macros, or work with a different property. The reason why I use RowHeight in the sample Format_Dates_Carriage_Return is for illustration purposes only. In particular, it ensures that the cell that I format using this macro shows the complete date. The Range.WrapText Property allows you to determine whether Excel wraps the text within the relevant range object. In the sample Format_Dates_Carriage_Return macro, that relevant range object is the range of cells returned by the Application.Selection property. This Excel tutorial explains the Range.NumberFormat property in great detail and shows how you can use it for purposes of formatting dates using VBA. Item #1: The Range.NumberFormat property. Item #2: Date format codes. In addition to reading about these 2 items, you've seen 25 different date formatting examples using VBA. Such a long list of examples may seem a little excessive, and there are several similarities between some of the date formats I applied. However, these 25 examples are evidence of the flexibility you have when formatting dates using VBA. At the same time, they provide a base for you to create your own macros to apply different date formats. This Excel VBA Date Format Tutorial is accompanied by an Excel workbook containing the data and some versions of the macros I explain above. You can get immediate free access to this example workbook by subscribing to the Power Spreadsheets Newsletter.